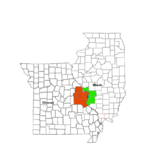 St. Francois County (/ˈfrænsɪs/) is a county located in the Lead Belt region in the U.S. state of Missouri. As of the 2010 census, the population was 65,359. The largest city and county seat is Farmington. The county was officially organized on December 19, 1821. It was named after the St. Francis River. The origin of the river's name is unclear. It might refer to St. Francis of Assisi. Another possibility is that Jacques Marquette, a Jesuit who explored the region in 1673, named the river for the Jesuit missionary Francis Xavier. Marquette had spent some time at the mission of St. Francois Xavier before his voyage and, as a Jesuit, was unlikely to have given the river a name honoring the Franciscans. The first European settlement in St. Francois County was made in the spring of 1796 at what is now known as Big River Mills by Andrew Baker, John Ally, Francis Starnater and John Andrews. They each located claims in 1794 but did not bring their families until 1796. Andrew Baker was the only one who had a house; the rest lived in camps. Baker, who built a large home along the north bank of Big River, established a community there. At one time he reportedly owned 200 slaves and was one of the wealthiest men in the area. Eventually all his children married and left the farm which consisted of 740 acres (3.0 km2). The farm was sold for taxes and later sold for $30 per acre. Several families settled that same year on Big River; among them were Elisha Baker, his son Elijah and Joseph Reed from Bois Brule Bottom. In 1798, Solomon George became the first to settle on Little St. Francois River. The county was officially organized December 19, 1821, from parts of Ste. Genevieve, Washington, and Jefferson counties. James Austin, George McGahan and James W. Smith were appointed by the Governor as a county court, and their first meeting, held February 25, 1822, was at the house of Jesse Murphy, where they appointed John D. Peers as county clerk. The first circuit court was held at the same place, and on April 1, 1822, the Honorable N. B. Tucker was named judge and John D. Peers served as clerk. Henry Poston, John Andrews, William Alexander and James Holbert were appointed commissioners to locate the county seat, and on September 22, 1822, D. Murphy donated 53 acres (210,000 m2) of land for that purpose which the county court accepted on February 27, 1823. In 1824, a stray-pen and a log jail, made double, and a brick court-house were built. At various times churches and schoolhouses were built in convenient localities; new settlers joined the pioneers, and peace and prosperity reigned. The following are some of the early citizens elected to represent St. Francois County in the Missouri House of Representatives: Henry Poston (1826); David Murphy (1828); Corbin Alexander (1830, 1832). At the beginning of the late American Civil War, St. Francois County, like most others in Missouri, was divided politically, and many took refuge from the enrollment act in the ranks under M. Jeff. Thompson, whose force at one time destroyed the Iron Mountain Railroad bridge over the Big River. According to the U.S. Census Bureau, the county has a total area of 455 square miles (1,180 km2), of which 452 square miles (1,170 km2) is land and 2.8 square miles (7.3 km2) (0.6%) is water. In the county, the population was spread out with 24.00% under the age of 18, 9.20% from 18 to 24, 29.40% from 25 to 44, 22.50% from 45 to 64, and 14.90% who were 65 years of age or older. The median age was 37 years. For every 100 females there were 103.30 males. For every 100 females age 18 and over, there were 101.90 males. The Democratic Party and Republican Party predominantly controls politics at the local level in St. Francois County. Democrats hold all but four of the elected positions in the county. St. Francois County is divided into three legislative districts in the Missouri House of Representatives. District 115 — Currently represented by Elaine Gannon (R-De Soto). It consists of the northern parts of the county, including Blackwell, French Village, and part of Park Hills. District 116 — Currently represented by Kevin Engler (R-Farmington). It consists of the southeastern section of the county, including part of Farmington. District 117 — Currently represented by Mike Henderson (R-Bonne Terre). It consists of the western parts of the county and includes the communities of Bismarck, Bonne Terre, Desloge, Doe Run, Iron Mountain Lake, Leadington, Leadwood, and parts of Farmington and Park Hills. All of St. Francois County is a part of Missouri's 3rd District in the Missouri Senate and is currently represented by Gary Romine (R-Farmington). Former U.S. Senator Hillary Clinton (D-New York) received more votes, a total of 5,418, than any candidate from either party in St. Francois County during the 2008 presidential primary. She also received more votes than the total number of votes cast in the entire Republican Primary in St. Francois County. ^ "Parishes - Nativity of the Holy Virgin Mary Church". oca.org. Retrieved 2018-03-26. ^ "Archdiocese of St. Louis – The Roman Catholic Church in Saint Louis, MO". archstl.org. Retrieved 2018-03-26. ^ Breeding, Marshall. "Bonne Terre Memorial Library". Libraries.org. Retrieved May 8, 2017. This page was last edited on 14 February 2019, at 04:44 (UTC).